But just barely and only for a minute as I just wrote a post and then the computer froze and since I didn’t save it, I’ve gotta start all over again – and I’ve gotta get up at 4:30 for another sunrise at the temples, so this is definitely gonna be a quickie! 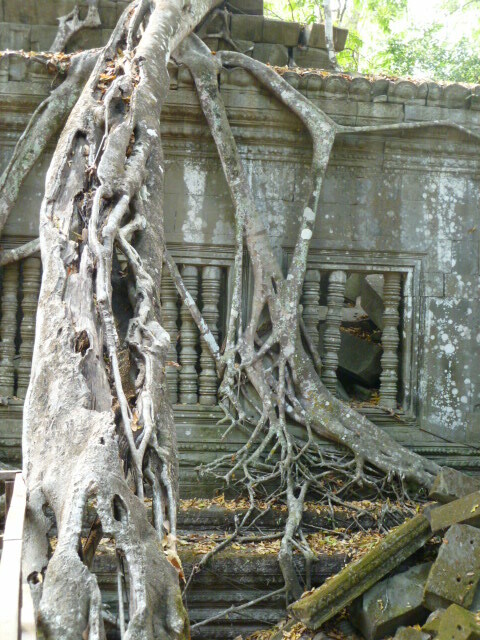 I’m having a most amazing time here at the temples of Angkor Wat – have been in the area for over a week and have been at the temples most all of those days – from before sunrise to after sunset – coming home, uploading photos, eating and crashing – it’s been exhausting and exhilarating and I’m thrilled with these experiences of a lifetime! Add to the temples an amazing concert I got to see the other night and truly, I feel so blessed! More to come, soon, I mean it! I’m headed out of here to Battambang after my final sunrise at the temples tomorrow morning and I’ll have plenty to say if I ever find quiet time again! 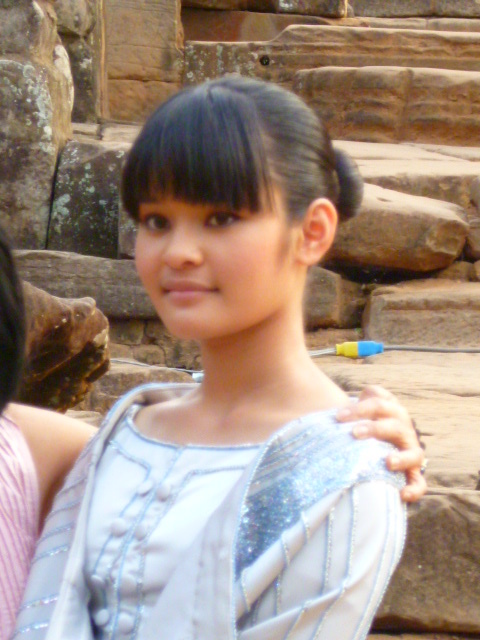 Until then, here’s a few images I especially like, one of my favorite temple and two from the extraordinary concert of BosbaPANH, a 13 year-old Cambodian young woman soprano who rocked the Bayon Temple this past week-end — AMAZING! Beng Melea Temple was filled with these kinds of images - amazing, eh?! The picture of beauty, grace and elegance - and 13 years old! I’m closing out Month 1 tonight and ready to welcome the next leg of this journey! But for now, it’s sleepy time! Glad you enjoyed – I was thinking of you throughout the concert and thinking how much you would have loved it! Wow, Christina! The photo of the temple with the lasers, etc., is spectacular! Was that the concert where the young woman sang? Love hearing from you, dear one! Oh, I’m so excited for you! I went to BosbaPAHN’s web site and learned that this was a most unique musical happening…she is simply beautiful. How amazing that you were in this place on earth at this moment in time. I want to jump up and down – maybe I really want to skip!!!!!! Skip, yes skipping is a very fine thing to do – but best, really, when done with someone else – I know someone who may be available to do this with you – wait a few months and we’ll make it happen! So glad you checked her out on the internet – I have more to say about the concert which I’ll do in another post! How is it possible you’ve only been gone a month? Seems like sooooo much longer than that! Glad we had a chance to skype these last few days…been missing me some sistuh! Saw the concert photos on snapfish – wow -wow -wow!!! Amazing! 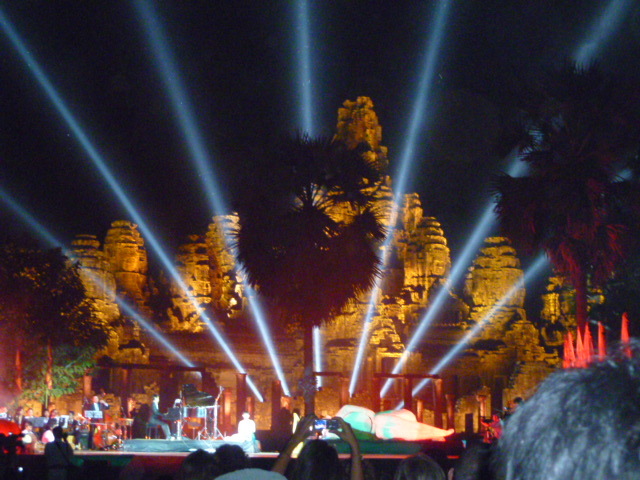 I looked on You Tube for Bosba Panh and there was a promo for the Angkor concert! How lucky for you that you got to experience this! Yes, only a month, although it feels so much longer to me, too! So grateful I got to be at the concert – have way more to say about it, which I’ll do another time!